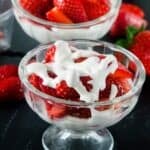 Strawberries and whipped cream recipe – Juicy strawberries arranged in a bowl topped with delicious vegan whipped coconut cream so perfect to snack on. I’m seriously in love with this strawberries and whipped cream dessert recipe, why you may ask? Well because it is SO easy to prepare and once again a dairy free option which I’m sure my dairy intolerant audience will enjoy. You do not have to lead a life which omits the consumption of dairy to reap the benefits of my dairy free recipes. I urge you all to at least give it a try, even if it’s just one time. Now I’ve said this a billion times already, I am NOT a dessert type of girl, I usually skip dessert at restaurants. On the other hand, when I’m at home I make dessert for my family and maybe if I’m feeling lucky I might (being the operative word here) eat a very small portion at the maximum. As a little girl my mother used to make lots and lots of strawberries themed recipes from cheesecake to jam and I almost forgot about that amazing strawberry mousse she would make for us in summer. 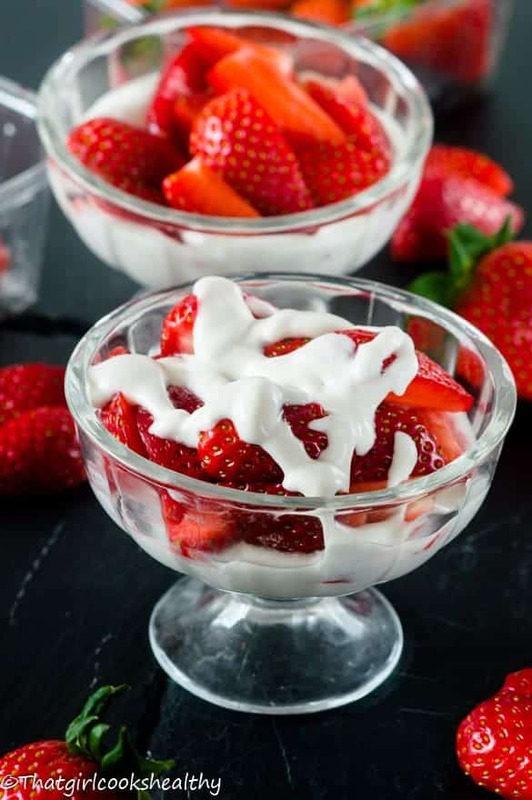 Also, I recall, seeing my mother whip double cream into a fluffy consistency and then spooning a dollop of the cream onto some rather large strawberries. 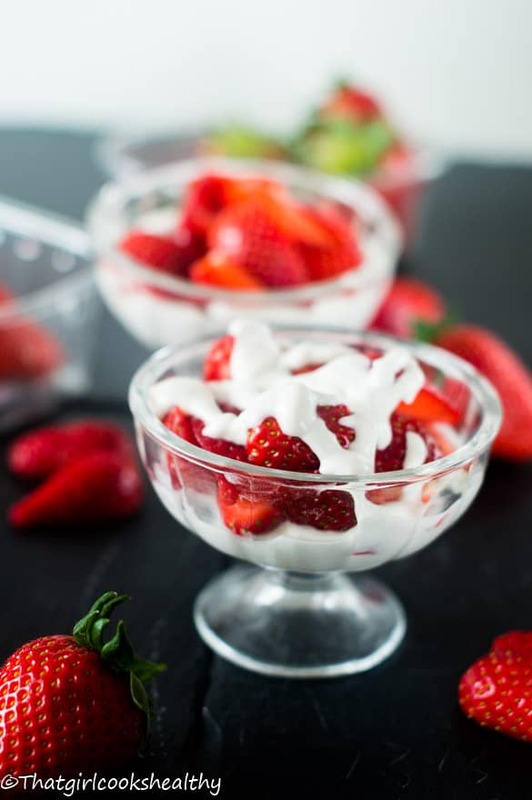 While making this recipe it evoked cheerful memories of my childhood, visions of my mother with her feet up, relaxing with strawberries and cream. 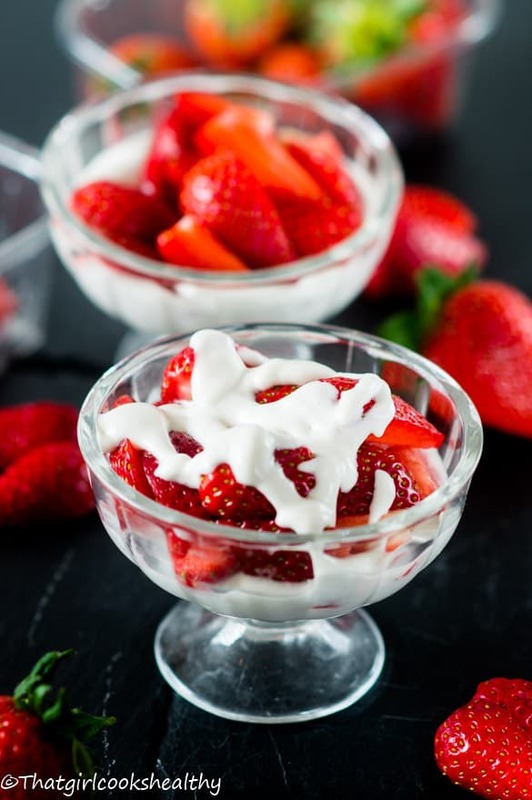 As a food-a-holic I couldn’t resist the opportunity to make a vegan style version of this strawberry dessert with whipping cream. In short non dairy cream is cream that’s free from lactose/animal milk using milk that is plant based. There’s a pleasantly surprising catch to the recipe, the cream is made from canned coconut milk. Canned coconut milk is making huge waves in the vegan world right now, it is highly favoured and regarded as a viable substitute to traditional heavy cream. This dairy free whipped cream is quite doable thanks to whomever suggested scooping out the coconut solids and then whipping them into cream. Equipment to use – You can use either a food processor or an electric mixer with the whisk attachment to create a cool whip. Storage/Cool coconut milk – The texture of the cream may vary depending on room temperate/storage. If you intend on using canned coconut milk to make whipping cream I would suggest storing it somewhere cool – do not freeze! By storing the canned coconut milk in a place that is cool, allows the solids to form or for the milk to yield a thick consistency. Remember we are only using the solids/top part of the milk. Use a spoon to scoop it out, similar to what I advised in my chocolate chia seed pudding. Sweetener – to balance out the coconut taste I used coconut sugar but you can use my powdered coconut sugar for a finer consistency. 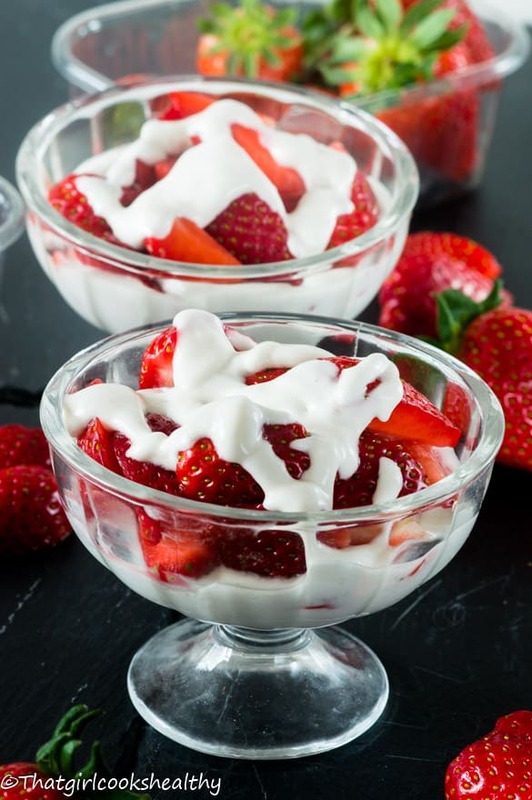 Aside from the fact that this strawberries and whipped cream recipe is vegan/dairy free, it is loaded with antioxidants which keep our immune system’s white blood cells healthy. They do so by producing antibodies a blood protein that recognises and reacts to viruses, foreign invaders and bacteria. In theory, what you are consuming is nothing but goodness, fruit that nourishes the body’s external and internal organs. I dare you to eat this as an after dinner treat, you know you want to! 2lb of fresh strawberries, washed, halved with stem removed. 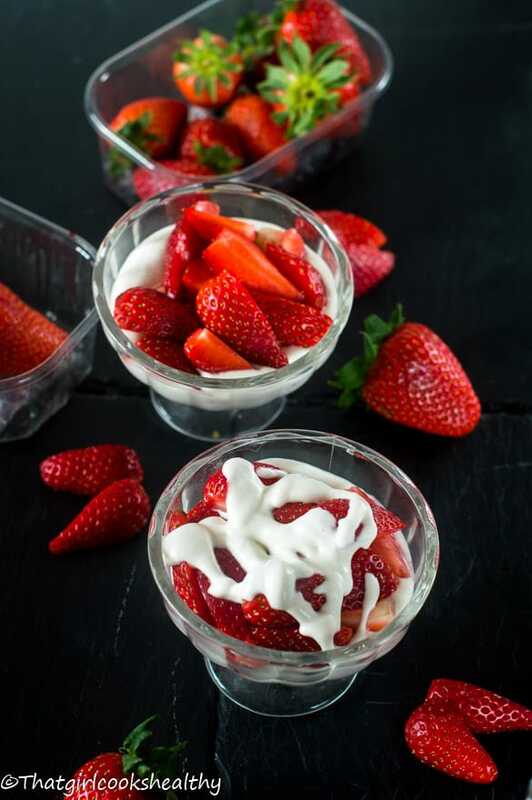 Arrange the strawberry halves in a bowl our your choice. Open the can of coconut milk and scoop off the coconut solid only into a medium sized bowl then discard the clear liquid underneath. Use a hand held mixer to whip the coconut solids into a thick cream. This should take a minute or so to achieve. As you whip the cream, add the two tablespoons of coconut sugar. Once the thickness of the cream has been met, simply scoop this onto the strawberries. I really need to hop on this coconut milk train! I keep seeing whipped “cream” recipes using it and it sounds so good. I love that there is such a simple substitution available out there! Strawberries and cream sounds absolutely delicious. So perfect for spring and summer evenings! Hi Tracey, vegan whipped cream is the best thing that can happen for vegans or people who are dairy intolerant. Definitely give it a try, the results are outstanding. I actually prefer it to milk. It is addictive. Spacing my stock of coconut milk n cream of coco nut is what I have a hard time doing. It is soooo delicious. Yes it is highly addictive isn’t it. Love that the whipped cream is vegan! Thanks Mica, that’s the best part about the recipe. Yuuuum! I’m about to start eating more vegan/vego meals and this will be perfect. YES! Glad to have you on board. I’ve bookmarked this for the next time my vegan sister in law is over 😀 great post!